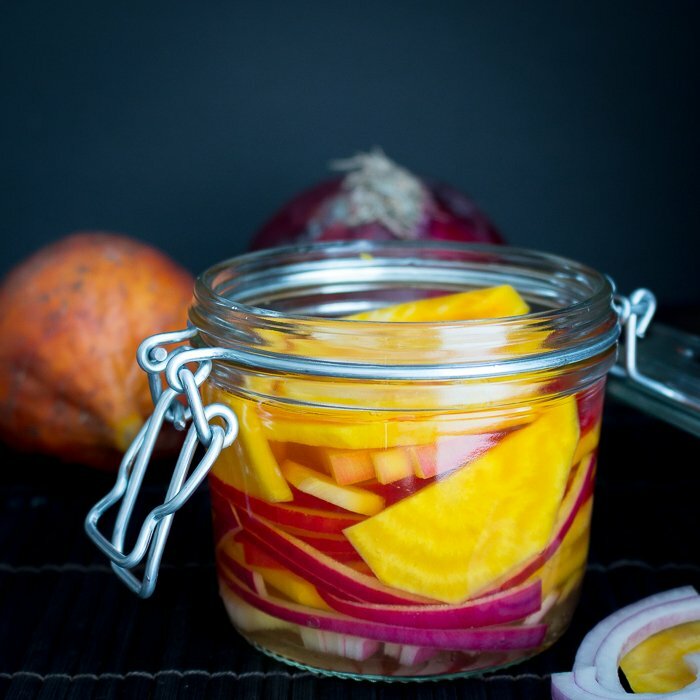 Gingered Red Onion Pickled Golden Beets are lip smacking delicious, take less than 10 minutes to whip together and we bet you can eat just one. We have been on a huge refrigerator pickle celebration here at Healthy World Cuisine (HWC) Magazine. The Farmer’s markets are plentiful with fresh produce. Sometimes so much that we have an overflow of veggies. You can pickle any vegetable you desire. If you have an overflow, we bet you can pickle it! 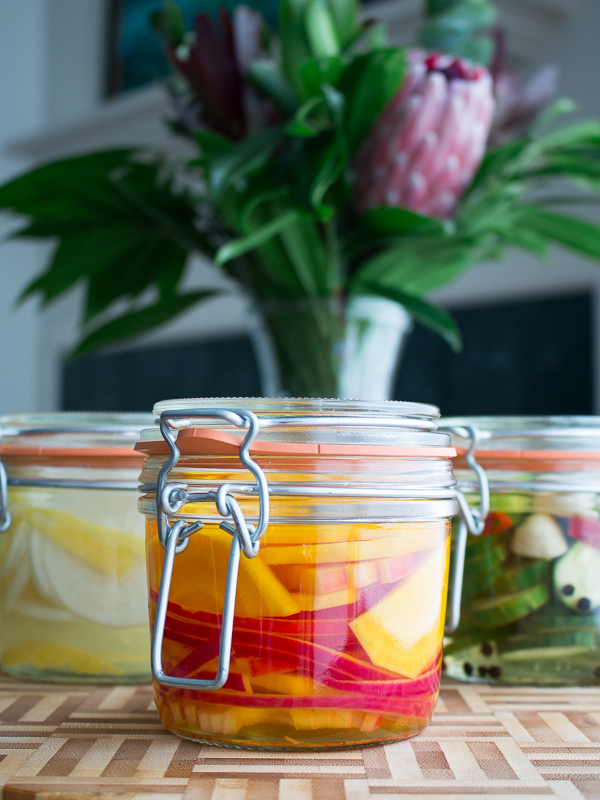 Refrigerator Pickling is a super easy way to preserve veggies for at least a month. We really have no idea if they will last a whole month as we cannot seem to keep them stocked for more than a day in the refrigerator. One awesome finding is that these Gingered Red Onion Pickled Golden Beets are super easy to replenish when your family and friends inhaled the entire batch in one sitting. Essentially all you need to do is chop up more beets and onions and maybe a sliver or 2 of fresh ginger and place in the existing pickling juice and wait about 6 hours and you are good to go. Seriously, have done that about 4 times this week alone and it works like a charm. Be sure to check out our Spicy Cucumber Refrigerator Pickle recipe and Lemon Diakon Radish Refrigerator Pickle recipes for more pickle inspiration. We do not have a favorite as they are all three so very different and it is fun tasting all 3. 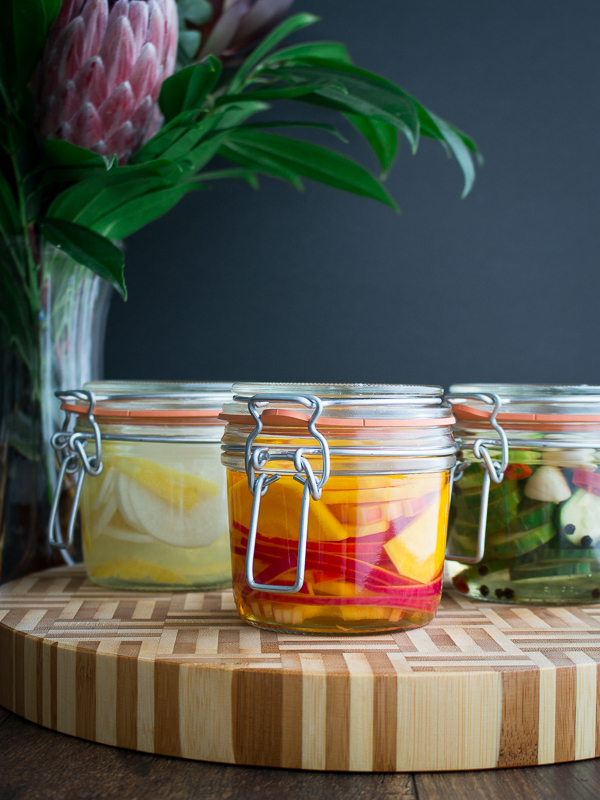 Did you know that it takes less than 10 minutes to make these refrigerator pickles? 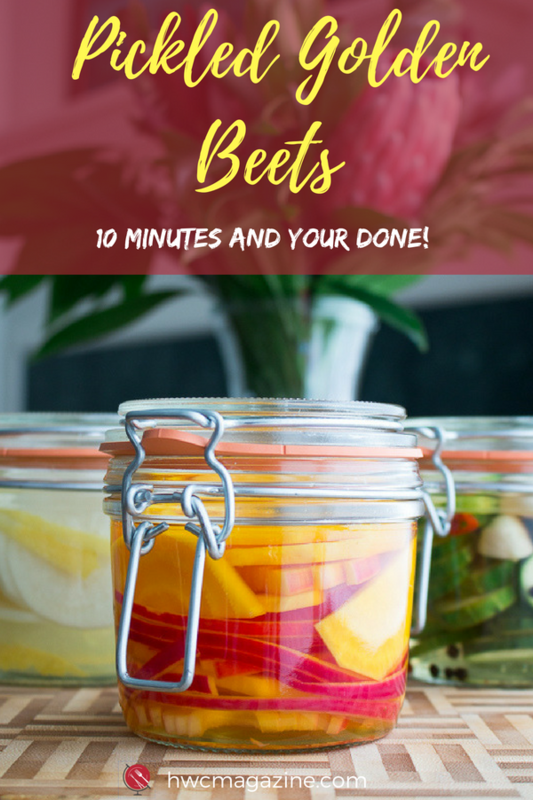 Seriously only 10 minutes, no cooking, no turning on the stove, no sterilization of canning jars and no fussy details. Now that is our kind of cooking! How many of you have gardens? 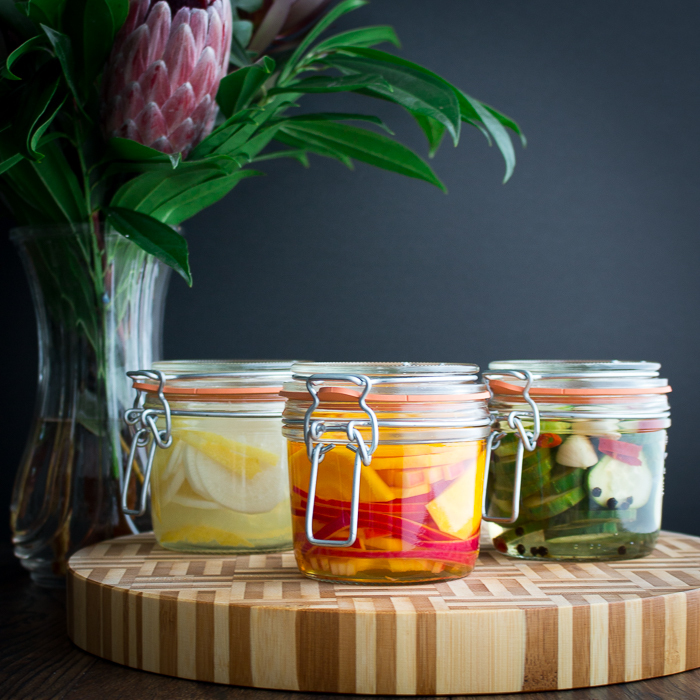 You are going to love this idea as making refrigerator pickles is a great way to preserve all those vegetables when they all go to harvest at the same time. After all you can only give so much away and your kids cannot be selling those huge zucchinis that could be used as a floatation device at their lemonade stand. Quick refrigerator pickle your veggies! You can pickle carrots, string beans, asparagus, garlic, radishes, beets, broccoli, essentially anything except lettuces or green leafy veggies. Do you know the first thing that everyone says when they take a bite of Gingered Red Onion Pickled Golden Beets? Yum, they are crispy and gingery and naturally sweet. There you have it? How many of you grew up in a household that made those mushy pickled beets with the five spice and cinnamon and the pure thought of that makes you gag? Ok, we are raising our hands high as for years, we would not come a hundred yards of a beet as we were certain it had that god-awful taste. Have no fear, these golden beets are totally different. They are all natural with refreshing taste, crispy and have the natural sweetness of mother nature and they are a super fun brilliant yellow/orange color. That is not dye. These are organic natural golden beets. We even found that after about 24 hours, our red onions started to turn the golden yellow color too. You may also use regular red beets for this recipe if you would like. 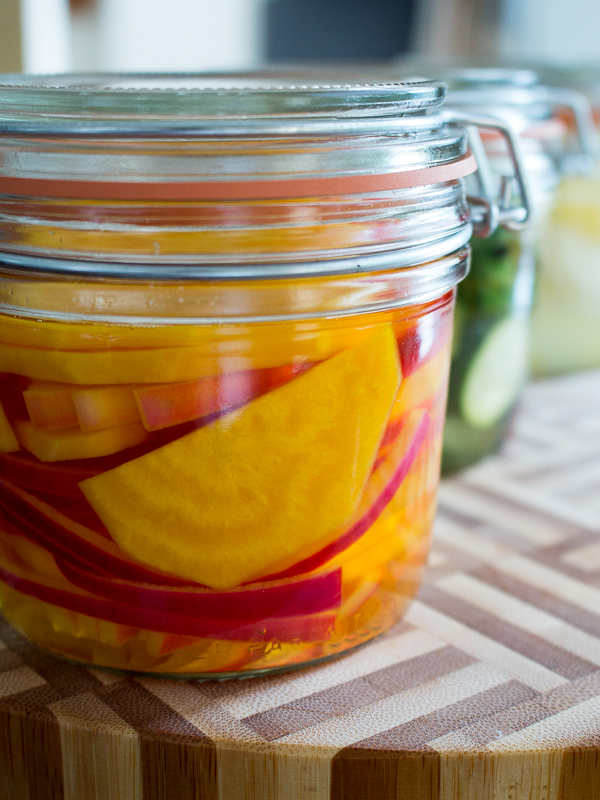 Gingered Red Onion Pickled Golden Beets are fabulous in salads, sandwiches or along any meal to cleanse the palate. Heck they are so good we like to sneak away with the whole jar and just eat as a snack. 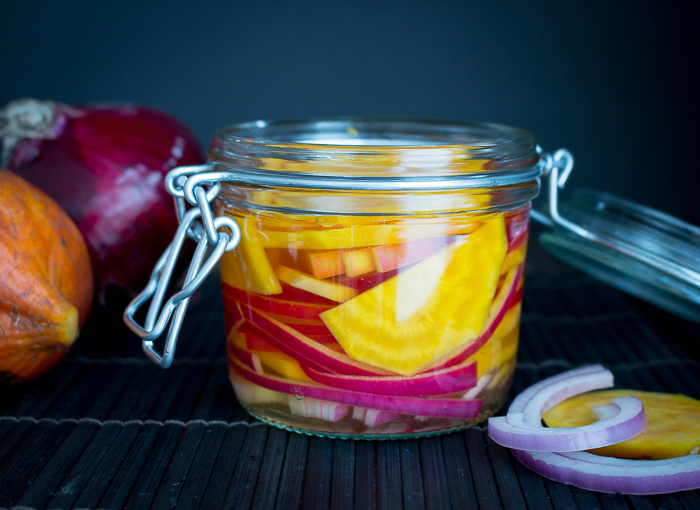 Gingered Red Onion Pickled Golden Beets are vegan, gluten-free, dairy-free and delicious. We have only one word of caution, beet juice stains so be careful to clean up quickly. We peeled the raw beets with our bare hands and sliced and just washed well and no staining. However, if you are worried about your manicure be sure to wear gloves when working with beets. If you clean up the juice right away, it usually does not stain but a little vinegar or bleach if you must will take the stains out of most hard kitchen counter surfaces. We used Heinz White distilled vinegar as we always have the best luck with this brand. However, you may also try red wine vinegar or apple cider vinegar to change things up a bit. Have fun with the recipe and change things up as you desire. There are just some spice additions like ginger and onions with the sweet beets that make these pickles so good that you can’t stop eating them. We crave a little fresh crunch in our dishes with the heat of the summer. How about you. 1Wash your glass containers with hot soapy water and rinse well and allow to air dry. 2Place your sliced beets, red onion and ginger in your glass containers alternating between vegetables. 3Mix vinegar, salt and stevia together. Taste and adjust vinegar solution, salt and stevia to your liking. If you like it saltier add more salt and if you like it sweeter add more stevia. Pour over vegetables and close the lid. Refrigerate at least 6 hours or overnight. Enjoy.